Seduced by Thursday’s sunshine and my weather app’s promise of another fine day, I skipped another workout at the Y and headed out for a day at Theler Wetlands and Port Orchard Marina. I should have known better, but at my age you can’t afford to miss many days of sunshine with so much darkness ahead. When I reached Theler Wetlands I texted Leslie, “34°. Totally fogged in. Yesterday was the day.” It was still socked in when I reached home around 1:30. Not sure if the sun finally came out after I got home, but if so, I didn’t notice it. Friday was definitely a reminder that winter is not over, despite a few sunny, balmy days. I walked a ways before I could see anything but fog. 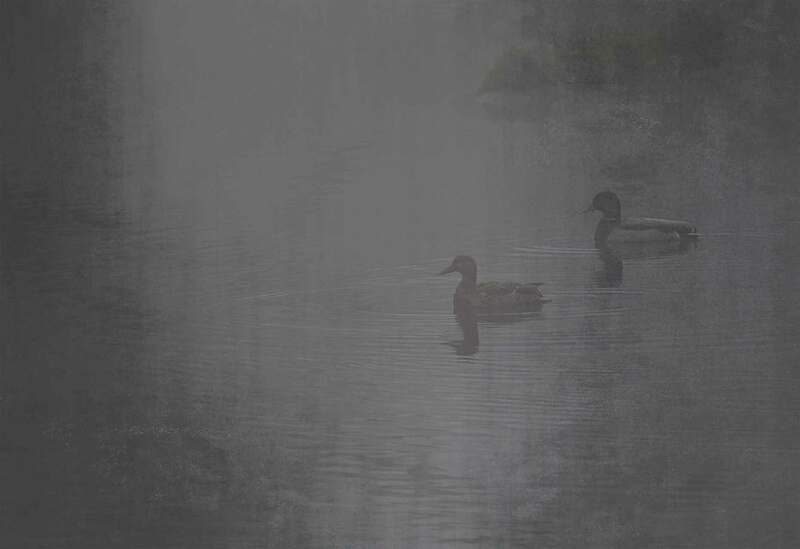 Finally as I walked along the Union River I saw this pair of Mallards floating in and out of the mist, almost dreamlike, a feeling enhanced by an almost eerie silence. I was reminded that I like dreamlike and eerie. 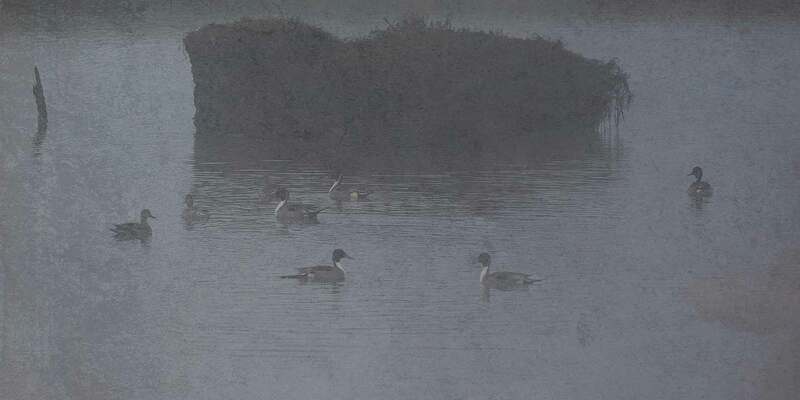 A half hour later the fog had lifted, slightly, and I could actually make out a small flock of Northern Pintails floating on a rising tide. 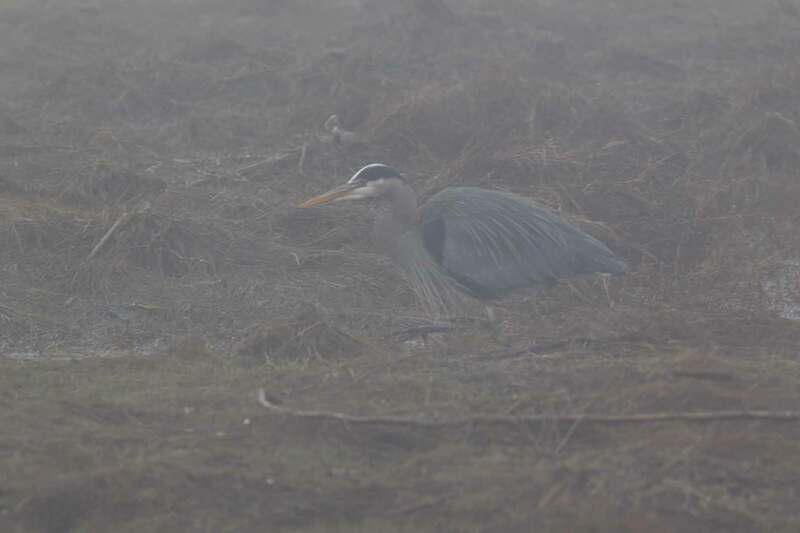 It must have been nearly 10:00 by the time I reached the turn-around-point on my walk, and I might not have seen a nearby Great Blue Heron stalking the wetlands in the fog if another walker hadn’t pointed it out to me. The heron’s grayish blue feathers seems like nearly perfect camouflage on mornings like this. No wonder it’s a year-round resident. It wasn’t the day I’d expected, but quiet, meditative walks alone are nearly as rare as bright, sunny walks. Both are to be treasured.